In 2008 when I started this blog it was a place where I shared the crazy life of being a mom of so many kids… boys specifically. Our family has grown even more since then. About a year after starting my blog I began sharing my weekly meal plans. We were on a pretty strict budget back then and a one income family. 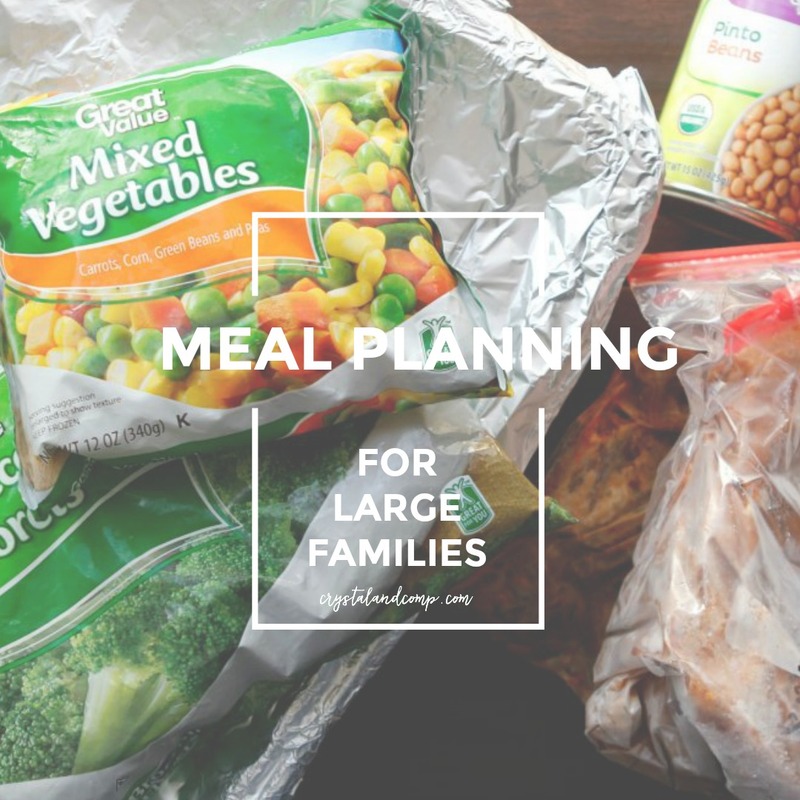 Sharing my weekly meal plans encouraged me to be organized in my cooking and be accountable with my dinner plans. Over time I created a step by step method for how to meal plan. In almost ten years this blog has become a place where I help moms find solutions for dinner time with my recipes and meal planning tips. Over the years I have shared over 225 weekly meal plans here on my site.I also love utilizing my blog as a way to help moms find educational resources for those who homeschool and supplement a public school education. That is two things busy moms are looking for: dinner help and learning activities for kids. Over the last four years I have gotten away from sharing my meal plans each Monday. Some weeks I get away from meal planning completely…. I let all of my life responsibilities take control. We end up eating out and my husband is so tired of it. Honestly, we all are. It get’s incredibly expensive and adding two new little ones to our home over the last two years has made eating out even more expensive. Who goes to a restaurant, orders $80 plus in food for their family, and then their kids do not eat it. US too!! Its so frustrating. Or, how many times do you eat out, order for your large family, the food comes and the quality is awful? You head home feeling like you could have done a better job at home. And the truth is, you really could have done a better job cooking at home. Here is what I am feeding our family of eight this week. This includes my husband, myself and six boys. Our boys are 16, twins who are 11, an 8 year old, a 3 year old and an 18 month old. We go through a lot of food at our house! Cheesy Chicken Pasta– this is one of my easy go-to meals. It’s an all-in-one meal and there is no need for additional sides. This has veggies, meat, pasta and cheese all in one pot. This week I ordered 10 pounds of frozen chicken breasts in my online grocery order. I still had about 3 pounds left in the freezer from my last order, so we have about 13 pounds total in the freezer now. This should last us a good 3 weeks so I will have lots to hold on to after this week. Baked Spiral Ham and Pressure Cooker Black Eyed Peas– it feels like it has been forever since I have baked a ham. This week when I did my online shopping from Walmart, I added a spiral ham to my cart. Have you tried online grocery shopping with Walmart yet? Game changer! I have been using them for a little over a year now and I am pleased. I am just going to put it in a 9×13 pan and bake. I also bought a pound of dry black eyed peas and I am excited to make these in the pressure cooker. I am also going to fry up come cabbage. Have you ever had fried cabbage? Totally southern and totally delish! Ham Mac and Cheese Bake– I will use leftover ham from New Years to make this. I will serve it with a salad. If you’re baking a ham for New Years or if you baked one for Christmas, here are 20+ recipes that are perfect for using up leftover ham! I suggest dicing up the ham and freezing it in 1-2 cup portions and making some of these recipes later in the coming weeks and months. Slow Cooker Chicken Broccoli Alfredo– I am going to make the chicken in my pressure cooker. I have a 6 quart Instant Pot and it will cook the meat in the pressure cooker after. Six chicken breasts that are thawed can cook in 15 minutes or less. I am also using penne pasta because I bought 4 packs of it at Walmart when I did my online shopping. You can check out one of my shopping experiences from a year ago and see how the process works. Click here to get $10 off of your first order! Spanish Rice– this is another all in one meal. It takes three ingredients; brown rice, a jar of salsa and black beans. Cooks in less than an hour on the stove. If you use white rice it will cook a bit quicker. We love this!! I top with cheese, avocado, sour cream and tomato slices for those who like it. This is seriously one of our favorite meals since I started making it in the spring. Leftovers– I always dedicate a day to leftovers. If there are no leftovers we may eat out or order pizza. 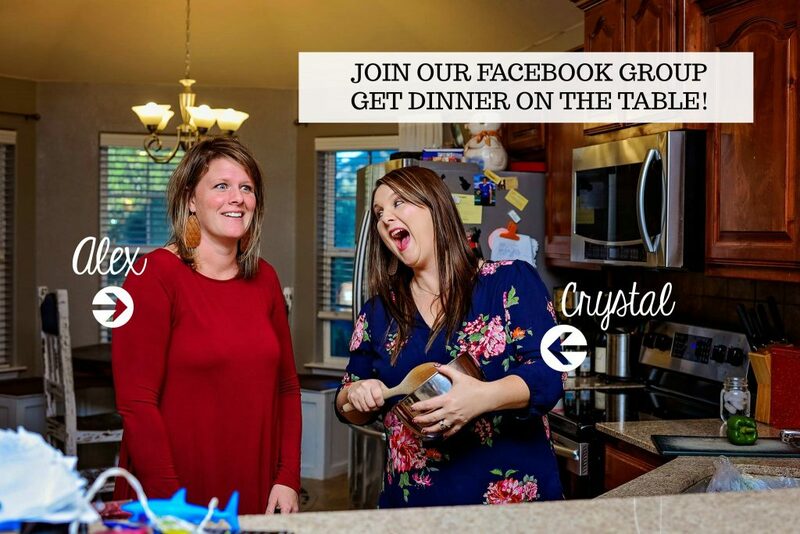 If you need help with meal ideas you really should join our Get Dinner on the Table Facebook group. In 2018 my SIL Alex and I will be doing a freezer meal FB Live once a month. We provide a grocery list, recipes with instructions and film assembly live. You need to join the group to have access to all the info and all past freezer meal plans. Fr me, online grocery shopping helps me stay on track with my grocery budget. No impulse shopping, I can easily price check, remove things from my cart before I checkout, etc. I can have my shopping list open in one tab and the shopping cart open in another tab and get all of my groceries ordered in 30 minutes or less. It is a great way for me to save money and time! 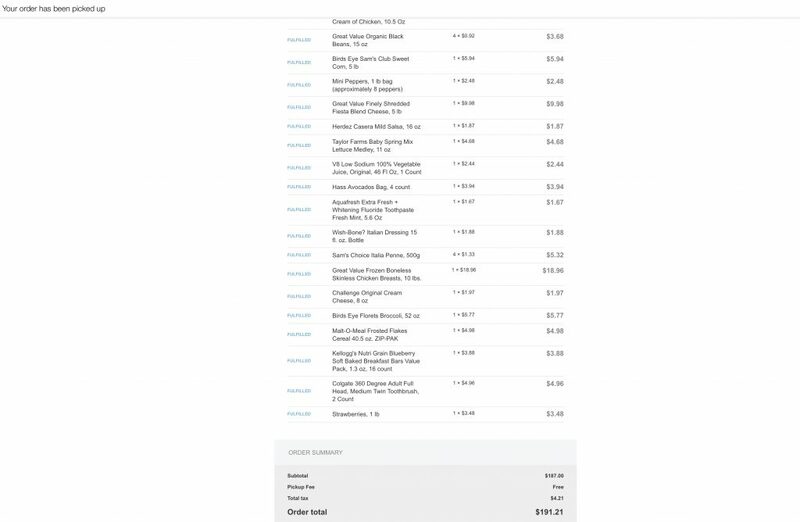 Here is what my Walmart online grocery order looked like. This included diapers, wipes, toothbrushes, toothpaste, etc. I do get a $10 credit for each person who uses Walmart grocery pickup for the first time using my link. You get ten and I get ten. Win win! !